JEL classification: F31, G15, G2. Covered interest parity (CIP) is the closest thing to a physical law in international finance. It holds that the interest rate differential between two currencies in the cash money markets should equal the differential between the forward and spot exchange rates. Otherwise, arbitrageurs could make a seemingly riskless profit. For example, if the dollar is cheaper in terms of yen in the forward market than stipulated by CIP, then anyone able to borrow dollars at prevailing cash market rates could profit by entering an FX swap - selling dollars for yen at the spot rate today and repurchasing them cheaply at the forward rate at a future date. Yet since the onset of the Global Financial Crisis (GFC), CIP has failed to hold. This is visible in the persistence of a cross-currency basis since 2007. The cross-currency basis indicates the amount by which the interest paid to borrow one currency by swapping it against another differs from the cost of directly borrowing this currency in the cash market. Thus, a non-zero cross-currency basis indicates a violation of CIP. Since 2007, the basis for lending US dollars against most currencies, notably the euro and yen, has been negative: borrowing dollars through the FX swap market became more expensive than direct funding in the dollar cash market. For some currencies, such as the Australian dollar, it has been positive (Graph 1, left-hand and centre panels). Initially, the violations of CIP were seen as a reflection of strains in global interbank markets. Specifically, heightened concerns about counterparty risk and constrained bank access to wholesale dollar funding inhibited arbitrage during the GFC, and again during the subsequent euro area sovereign debt crisis. But, puzzlingly, the violations have persisted even after these strains dissipated. The basis has widened since 2014, for both short- and long-term borrowing, despite fading concerns about bank credit quality and recovery in wholesale dollar funding markets.2 Why has arbitrage not reduced the basis to zero? The rest of this feature is organised as follows. The first section lays out the framework for our analysis. The second and third sections examine, respectively, the variation of the basis across currencies and over time in the yen/dollar basis. The conclusion highlights some implications and outstanding questions. The basic mechanics behind CIP are fairly simple. Interest rates in the cash market and the spot exchange rate can be taken as given - these markets are much larger than those for FX derivatives. Hence, it is primarily shifts in the demand for FX swaps or currency swaps that drive forward exchange rates away from CIP and result in a non-zero basis (Box A). Any such deviations should, in principle, immediately trigger arbitrage transactions, bringing the basis back to zero. The reason is that, in an ideal world, CIP arbitrage is treated as riskless. By construction, FX swaps do not entail an open currency position. In addition, it is assumed that the credit, counterparty, market and liquidity risks involved are negligible. Unimpaired access to cash and derivatives markets then allows arbitrageurs to close the basis. where S is the spot exchange rate in units of US dollar per foreign currency, F is the corresponding forward exchange rate, r is the US dollar interest rate, and r* is the foreign currency interest rate. In practice, the relationship between F and S is read off market transactions in FX instruments, notably FX swaps and cross-currency swaps. A positive ("wide") value of (F - S), above, indicates that a party lending US dollars sells the foreign currency forward at a higher dollar price than warranted by the interest differential. Equivalently, a party borrowing US dollars via an FX swap - say, to hedge its US dollar asset - is effectively paying a higher interest rate on the swapped dollars than is paid in the cash market. In the above example, the FX swap implied US dollar rate, F⁄S(1 + r*), exceeds actual US dollar Libor, 1 + r, if the party borrowing US dollars in a cross-currency swap pays the basis, b, on top of US dollar Libor. Thus, failure of CIP has implications for the relative cost of funding in the cash and swap markets. Whenever CIP fails, one party ends up paying the currency basis on top of the cash market rates to borrow the corresponding currency, while the other counterparty in effect receives an equivalent discount when borrowing the other currency. CIP can also fail because of credit risks in the underlying investments. If CIP arbitrage is conducted by global banks borrowing and lending in the respective Libor markets, then a rise in counterparty credit risks in the interbank markets, typically captured using Libor-OIS spreads, could result in CIP deviations. Similarly, if banks or asset managers engage in CIP arbitrage using government bonds in the two currencies, then deviations might result from differences in sovereign credit risks, typically measured using sovereign CDS spreads. In each of the above examples, the price that is actually set in FX derivatives is that of the forward leg of the swap, F. As shown, CIP arbitrageurs will pass on their balance sheet costs of taking the other side of FX hedging demand via FX swaps as wider forward points, (F - S), than warranted by CIP. The per-dollar balance sheet costs themselves are represented by rp in this example. Since markets have to clear, the aggregate position of CIP arbitrageurs when the US dollar is at a premium in FX swaps will be equal to the aggregate net position of currency hedgers. The latter will be paying the forward points, (F - S), to hedge their US dollar assets. What are some of the real-world counterparts to rp in non-crisis times? In aggregate, rp will reflect any costs that banks or other participants assign to deploying their balance sheet in CIP arbitrage, which in turn will reflect their risk management practices. For individual players, these practices may even include absolute credit limits that would set a maximum for the underlying exposures to the underlying instruments and counterparties. Even without strict limits, the funding cost of the capital allocated to the arbitrage activity, notably to the (current and potential future) derivatives exposures involved, will prevent the basis from closing when it opens up owing to changes in hedging demand. The specific constraints, and hence the instruments involved, will also depend on the players acting as arbitrageurs. For instance, for highly rated supranational and quasi-government agencies, which can arbitrage the long-term basis thanks to their top credit rating by issuing bonds in US dollars at attractive rates and then swapping them out, rp is more closely related to the costs of placing bonds in different currencies. For hedge funds, which rely on collateralised markets to fund CIP arbitrage, the price and availability of repo market funding will play a significant role. In recent years, the textbook CIP arbitrage framework has been challenged in two ways. Initially, the focus was on the constraints on arbitrage arising from the banks' counterparty credit risk concerns and the wholesale US dollar funding strains that surfaced during crisis episodes. These episodes included the Japanese banking crisis (the "Japan premium", Hanajiri (1999)); the onset of the GFC in 2007-08 (eg Baba et al (2008), Baba and Packer (2009), Coffey et al (2009), Mancini-Griffoli and Ranaldo (2012), Levich (2012)); and the euro area sovereign debt crisis in 2011-12 (McCauley and McGuire (2014), Ivashina et al (2015)). Drawing on our more technical work (Sushko et al (2016)), the framework we propose in this study has two features. First, it focuses on one key source of pressure on the basis, namely net foreign currency hedging demand that is largely insensitive to the size of the basis. Second, similarly to other studies, it also assumes the presence of limits to arbitrage linked to the costs involved in deploying balance sheets, in turn reflecting tighter management of capital and funding risks. This can create a balance sheet constraint on CIP arbitrage that becomes more binding as the size of the aggregate FX hedging positions grows. Our framework gives rise to two hypotheses. First, in the cross section, the size and sign of the basis across currencies should be related to the net hedging position vis-à-vis the US dollar. Second, over time, the evolution of the basis should depend on that of net dollar hedging needs. Let us first consider each of the two components of the framework - FX hedging demand and constraints on arbitrage - in more detail. Hedging of open FX positions is the main proximate driver of the demand for FX swaps. We focus on three sources of hedging demand that are rather insensitive to the size of the basis, and, hence, exert sustained pressure on it even when it is non-zero: demand from banks, institutional investors and non-financial firms. The second source of demand arises from the strategic hedging decisions of institutional investors, such as insurance companies and pension funds. Institutional investors use swaps to strategically hedge foreign currency investments. In recent years, the term and credit spread compression on the back of unconventional monetary policies in major jurisdictions has boosted these cross-currency investment and funding flows.7 These investors' hedge ratios tend to be quite insensitive to hedging costs and to move slowly over time.8 Thus, anything that induces these investors to increase or reduce their foreign currency investments tends to put pressure on the basis. The third source of demand arises from non-financial firms' debt issuance across currencies as they seek to borrow opportunistically in markets where credit spreads are narrower. Under normal market conditions and for most currencies, this may not be an important factor. But it can become quite relevant when credit spreads differ systematically, for example when they are compressed by central bank large-scale asset purchases. 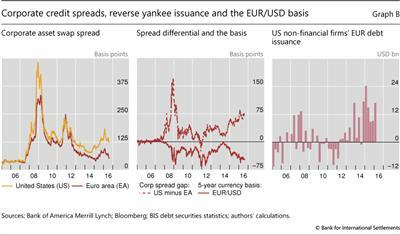 Recently, for instance, many US firms needing dollars have been issuing in euros to take advantage of very attractive spreads in that currency and have then swapped the proceeds into dollars (Box B). This allows them to use the dollars for their business purposes while avoiding a currency mismatch in euros. Essentially, through the swap market, they borrow dollars and lend euros. Corporate credit spreads in the euro bond market have fallen relative to those in the US dollar bond market, largely driven by ECB bond purchase programmes (Graph B, left-hand and centre panels). In response, US firms have found it more cost-effective to issue in euros, through so-called reverse yankee bonds, and then swap the proceeds into US dollars (right-hand panel). The hedging of currency risk by US firms issuing in the euro increases demand for cross-currency swaps. Hence, the widening of corporate asset swap spread differentials and the surge in euro issuance since 2014 have coincided with a marked widening of the currency basis (centre panel). For example, consider a BBB-rated US telecoms firm whose bonds yield 100 basis points over the interest rate swap rate in dollars, but only 50 basis points in euros. If CIP held, the firm would save 50 basis points by issuing in euros and swapping back to dollars. In fact, the firm would have an incentive to do that for all its new debt. One can then see the widening of the basis as tending to reconcile the different spreads in the two markets. According to data from Thompson Reuters, the majority of reverse yankee issuance has been long-term, with an average maturity of about 10 years and with 15- and 20-year tenors also commonplace. Issuance at shorter maturities is rare, because, from the perspective of the US non-financial issuer, the all-in issuance costs (ie taking the currency swap into account) of short-term euro-denominated debt are still greater than issuing short-term US dollar debt, owing to the wider currency basis relative to the corporate asset swap spread differential at the short end. Other factors could also put pressure on the basis, but we exclude them from our analysis because of data limitations. Firms' hedging of trade receivables or subsidiary cash flows are one case in point. Another could be speculative FX positions, which can rely on forwards and swaps (eg yen carry trades). We posit, therefore, that the sources of pressure we identify are sufficient to capture the key relationships.9 At the more fundamental level, monetary (Box C) and financial conditions, as well as institutional differences across the respective jurisdictions, largely determine the extent of foreign currency funding and investment flows in the first place. Monetary policy can boost hedging demand through both price and quantity effects. By lowering the yield curve and, in particular, by compressing the term premium and credit spreads, easing encourages investors to seek return and duration in foreign currency bonds and foreign issuers to sell bonds in the corresponding currency to obtain cheaper funding. Large-scale asset purchases strengthen these effects by withdrawing securities from the market. And so does the adoption of negative interest rates, which can result in negative yields stretching out to long maturities. 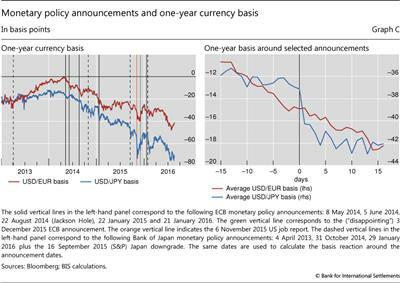 Much of the widening of the USD basis since 2014 has coincided with monetary policy easing announcements by the Bank of Japan (BoJ) and the ECB. Indeed, the widening began in earnest with the ECB's ramping-up of easing measures, including the 5 June 2014 announcement of negative rates (Graph C, left-hand panel). 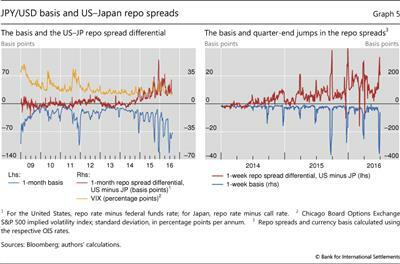 The announcement of ECB government bond buying (quantitative easing, QE) on 22 January 2015 also had a significant impact on the USD/JPY basis, owing perhaps to expected policy contagion or more technical factors (eg French banks' role as JPY/USD arbitrageurs). Similarly, the BoJ's Quantitative and Qualitative Monetary Easing (QQE) announcements as well as its move to negative policy rates saw the USD/JPY basis widen. 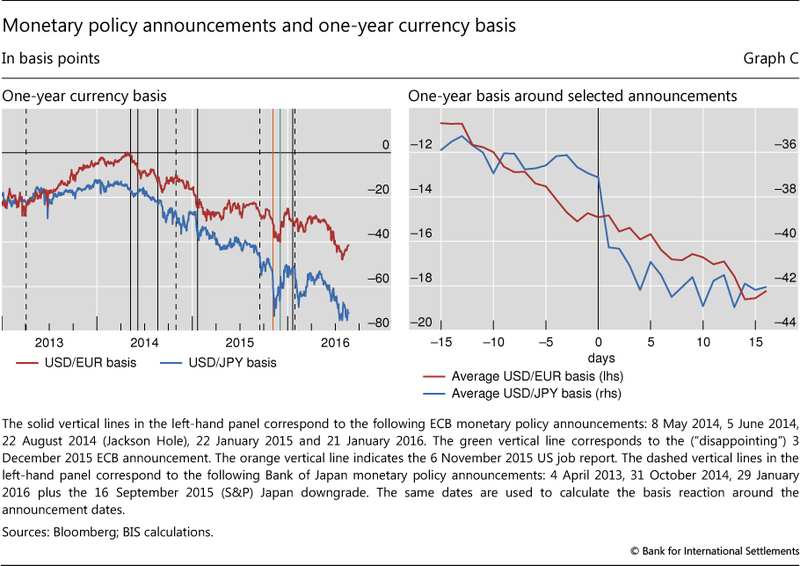 In fact, the short-term announcement effects were even starker for the BoJ (Graph C, right-hand panel). One possible explanation for the responsiveness of the basis to monetary policy announcements is that the swap dealers that provide currency hedges expect the outflows from the euro or the yen to increase when the ECB or the BoJ eases policy. This includes the flows hedged for currency risk, which push up the demand for FX swaps or cross-currency swaps. Hence, the swap dealers set higher prices for currency hedges, which results in wider CIP deviations. Conversely, when the ECB or the BoJ surprises with less easing than anticipated, dealers revise downwards the expected hedging demand coming their way, lower their prices and, hence, help narrow the basis. This happened on 3 December 2015 (green vertical line, left-hand panel): the announced ECB stimulus was lower than what market participants had expected in the run-up to the Federal Reserve's first rate hike. Such expectations had been firming during the previous month following the upbeat US jobs data release in November (orange vertical line). After the ECB announcement, market participants revised down their expected volumes of cross-currency flows out of the euro area. See Borio and Zabai (2016) for a survey of unconventional monetary policy measures that documents and discusses these effects. On the relationship of central bank deposit rate changes and the currency basis, see Bräuning and Ivashina (2016, Table IX). Structural changes in how market participants have been pricing market, credit, counterparty and liquidity risks post-crisis have tightened limits to arbitrage. Balance sheet space is rented, not free.10 Specifically, as a result of tighter management of risks and related balance sheet constraints, arbitrage now incurs a cost per unit of balance sheet. This cost is passed on to the pricing of FX swaps, introducing a premium (or discount, depending on the currency) in response to imbalances in the swap market. One result is that the currency spot-forward relationship goes out of line with CIP (Box A). Arbitrage can be both costly and risky. Typically, it requires the arbitrageur to enlarge its balance sheet, incur credit risk in both borrowing and investing, and possibly face mark-to-market and liquidity risk (given the need to transfer collateral or take paper gains or losses) in the valuation of the positions. While these risks and costs exist all the time, participants have been managing them more actively post-crisis. Before the GFC, these risks were not fully priced in the relevant markets and, partly as a result, dealer banks had raised their leverage to dangerous levels (Shin (2010)). The crisis brought them to light. Since then, pressure from shareholders, creditors and prudential authorities has reinforced and hard-wired participants' awareness. As a result, leverage has declined and there has been less willingness to deploy the balance sheet for activities that make heavy demands on it, such as arbitraging the basis. The bottom line is clear. These tighter limits on arbitrage make it harder to narrow the basis whenever it opens up as a result of pressures that reflect underlying order imbalances. In particular, even in the absence of bank funding strains like those seen during the GFC, a sufficiently high net demand for currency hedges could result in persistent deviations from CIP. Can our framework help explain how the sign and, possibly, the size of the basis vary across currencies? We test this by juxtaposing quantitative indicators for the various players' hedging demands and the basis.12 In evaluating the results, it should be borne in mind that the sample is necessarily limited, as we have to restrict it to freely tradable currencies in jurisdictions with no capital controls, with a highly rated sovereign and for which data are available. Assembling estimates of hedging demand runs into two types of limitation. The first is conceptual. Some financial institutions play the dual role of putting pressure on the basis and arbitraging it. For instance, banks' business models may lead them to fund themselves through swaps in order to hedge their balance sheet mismatches, even as they act as arbitrageurs. This means that proxies for their swap positions conflate their two roles. However, and despite such ambiguity, our results suggest that the balance sheet hedging motive dominates. The second relates to data availability. No statistics fully cover the hedging demand for a given currency; tough choices and approximations are needed. Hence, we focus on the three main sets of players - banks, institutional investors and non-financial firms - and even there we have to make a number of assumptions. Graph 2 shows indicators of hedging demand from the various sectors for four jurisdictions for which we were able to obtain better data: Australia, the euro area, Japan and Sweden. A positive value for a bar indicates net borrowing of US dollars against local currency via swaps (positive net FX hedging demand vis-à-vis the US dollar) for the corresponding sector, while a negative value shows net dollar lending. The figures are scaled by GDP. The graph reveals clear differences across countries and sectors. 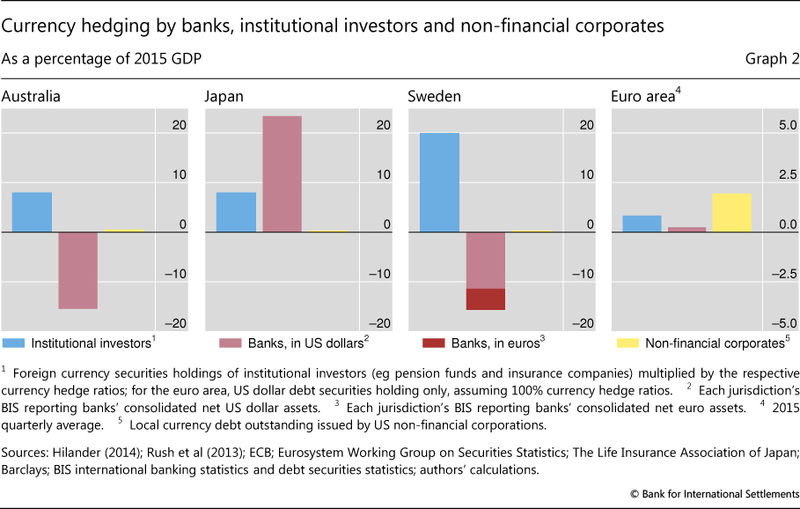 Especially noteworthy is the position of the banking sector relative to that of institutional investors. Where banks have a surplus of domestic currency deposits relative to domestic currency loans, they use the FX swap market to borrow dollars to hedge their dollar lending. In doing so, they compete with domestic institutional investors that use swaps to hedge their dollar investments. 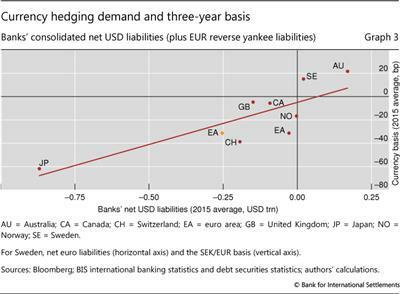 As a result, banks add to the aggregate hedging demand and hence to the size of the potential imbalance. This is the case in Japan, where they have used domestic yen deposits to fund their expansion abroad, mainly in dollars, by making heavy use of swaps. By contrast, in Australia and Sweden the banking sector provides a natural counterpart to institutional investors' hedging needs. That is, given the large domestic currency mortgage book relative to the domestic deposit base, banks rely on the FX swap market for funding. This offsets institutional investors' hedging demand. The hedging needs of US corporate bond issuers, which add to those of domestic institutional investors, are in general quite small compared with those of other sectors. The main exception is the recent experience in the euro area, where US non-financial firms' issuance in euros has surged since 2014. 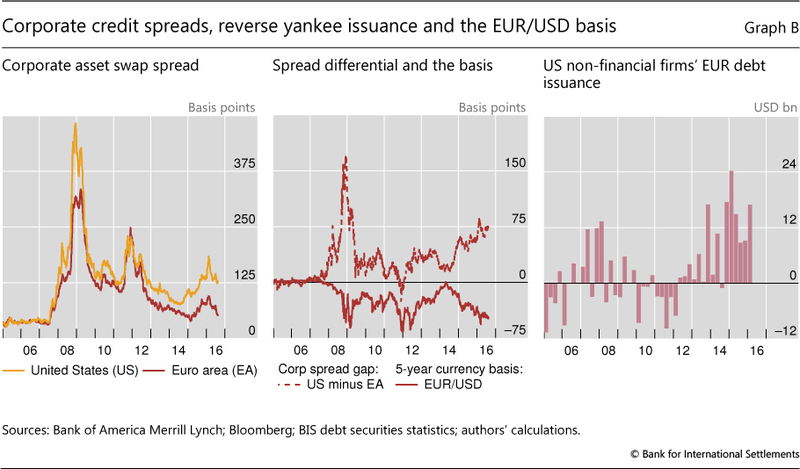 This reverse yankee issuance reflects the fact that euro-denominated corporate credit spreads have fallen significantly relative to those in dollars, largely because of ECB bond purchase programmes (Boxes B and C). The sign of the basis aligns quite well with these indicators. Where banks compete with institutional investors to borrow dollars through the swap market, as in Japan, the currency basis is negative, ie dollar borrowing via the FX swap market is in higher demand and hence more costly than in the cash market. The same is true in the euro area, where non-financial firms' demand for dollar borrowing via FX swaps looms large. By contrast, in Australia, where banks offset institutional demand for hedges by lending dollars in the swap market, the currency basis is positive. Focusing exclusively on the position of the banking sector in US dollars (or euros for Sweden) confirms the previous finding. In a sample of eight economies (now including also Canada, Norway, Switzerland and the United Kingdom), the banks' position is consistent with the sign of the basis (Graph 3). This also suggests that, in our sample, when banks are in the opposite position to institutional investors, their hedging needs are typically larger, so that they end up being the swing factor. Note also that Australian and Swedish banks' position is indeed exceptional: banks typically add to resident institutional investors' hedging needs, rather than offsetting them. In the case of the euro area, the fit improves significantly when we add euro-denominated bonds issued by US non-financial firms (reverse yankees). This addition raises our measure of currency hedging demand in the EUR/USD pair from less than $28 billion to as much as $250 billion (the EA dot moves to the left in Graph 3). We next test our hypothesis by examining the time series of the yen/dollar basis. This has been the most extreme and persistent non-zero basis among the major currencies, with banks and institutional investors both bidding for hedges. Moreover, it is the currency pair for which better data on the evolution of institutional investors' hedging needs are available. Before turning to the evidence, a few facts can help set the context. Our measure of the aggregate US dollar hedging needs of Japanese banks, institutional investors and US non-financial firms (samurai bond issuers) has increased considerably since the crisis: from $0.9 trillion in 2009 to over $1.2 trillion in 2015 (Graph 4, left-hand panel). Thus, Japanese banks' reliance on swaps to fund their foreign assets has reduced their capacity to serve as counterparties to non-bank hedgers in cross-currency markets and to arbitrage the basis. In particular, Japanese life insurers' search for yield overseas has led them to increase FX-hedged investments in US dollar-denominated bonds (with average hedge ratios of 60-70%).22 Issuance of samurai bonds has not played a significant role, owing to the thin corporate bond market in Japan. Confirming our hypothesis, after a clear break during the GFC, a remarkably close relationship emerged between variations in our measure of hedging demand and the basis (Graph 4, centre and right-hand panels). This is shown using the three-year basis, but the picture would be similar for other maturities. Pre-crisis, the basis was very small and stable, regardless of hedging volumes; post-crisis, it has tracked them remarkably closely. In particular, an increase in hedging demand has coincided with a widening of the basis further into negative territory. The sudden break in the basis during the GFC points to the emergence of the limits to arbitrage discussed above. But is it possible to find more direct evidence of these new balance sheet constraints? Some developments are consistent with them. First, as the GFC raised awareness of counterparty risk, many market participants switched from unsecured to secured funding sources, notably repo markets. Reliance on the repo market constrains the arbitrageurs' flexibility, since the borrower cannot obtain funds without having the underlying security to pledge as collateral. 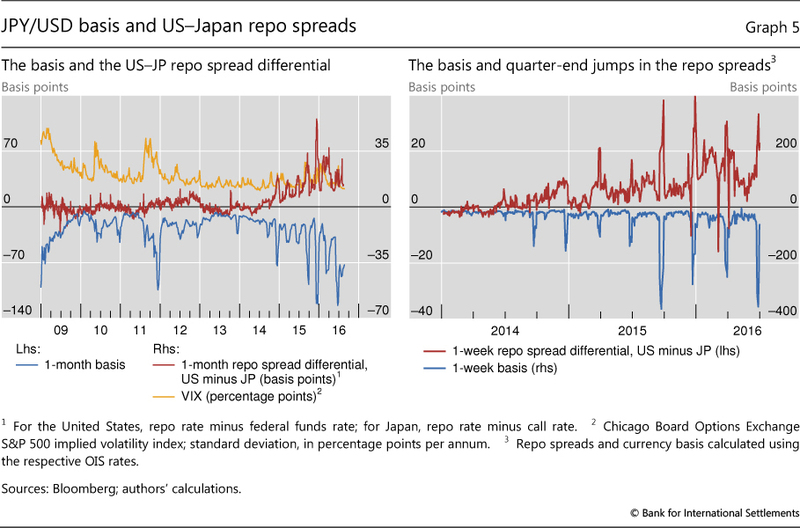 Since mid-2014, the Bank of Japan's move to increase government bond purchases (making them more scarce as collateral), even as the Federal Reserve stopped its net purchases, has made dollar repo funding more expensive relative to yen repo funding. As a result, arbitraging the yen/dollar basis has become more expensive, and the basis has widened even when financial market volatility (the VIX) has remained within normal ranges (Graph 5, left-hand panel). Second, since 2014 the basis has started to exhibit quarter-end spikes, along with repo rates, indicating that arbitrage has become harder (Graph 5, right-hand panel). This has coincided with the greater importance attached to quarter-end reporting and regulatory ratios following regulatory reforms. Third, the riskiness of claims on the Japanese official sector may also have played a significant role. 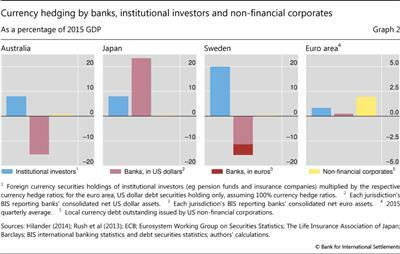 Banks' exposures to the Japanese official sector are already sizeable relative to their equity. 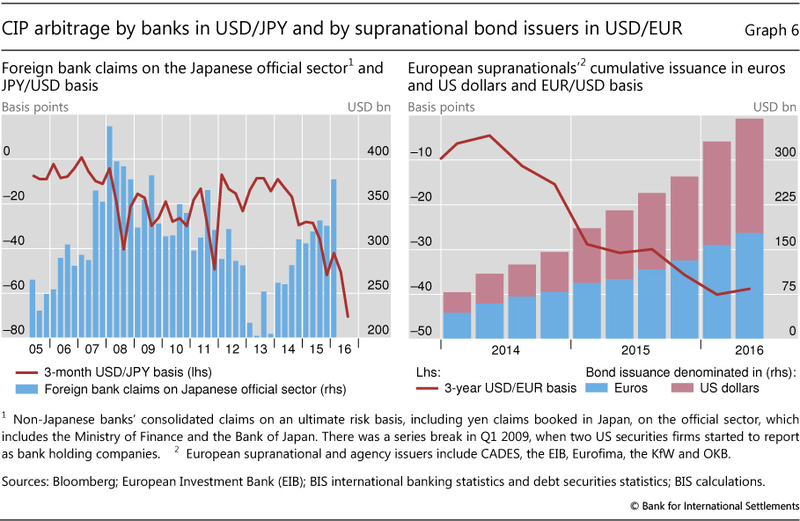 As the basis widened, BIS reporting banks, especially big US, French and UK banks, increased their claims on the Japanese official sector from about $200 billion in Q4 2014 to $323 billion at the end of 2015, no doubt in part reflecting their arbitrage activities (Graph 6, left-hand panel). At the end of the period, their exposure to the Japanese official sector, including both the central bank and the government, represented 10-19% of their equity. 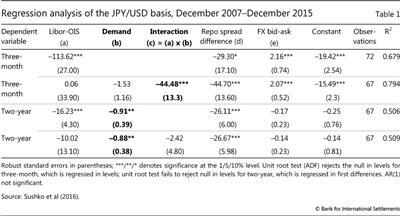 The widening of the yen/dollar basis following Standard & Poor's downgrade of Japan in 2015 highlights the role of internal limits on these exposures as a factor constraining arbitrage (see also Box C). We next test for the presence of a link between hedging demand and the basis as well as the role of arbitrage constraints econometrically. Specifically, we add our quantitative indicator of aggregate hedging demand to standard specifications of the basis.24 Our results provide evidence for such a link. The standard specification for the three-month basis - the tenor on which most of the empirical work has focused - is shown in the first row of Table 1. The size of the basis is considered to be a function of counterparty risk (Libor-OIS spread), funding liquidity (repo spreads) and market liquidity (currency market bid-ask spreads). This is in the spirit of, for instance, Mancini-Griffoli and Ranaldo (2012) and Pinnington and Shamloo (2016). The specification performs reasonably well: the coefficients of the explanatory variables are all economically and statistically significant. Once we add the quantitative indicator of hedging demand, the performance clearly improves (Table 1, second row). 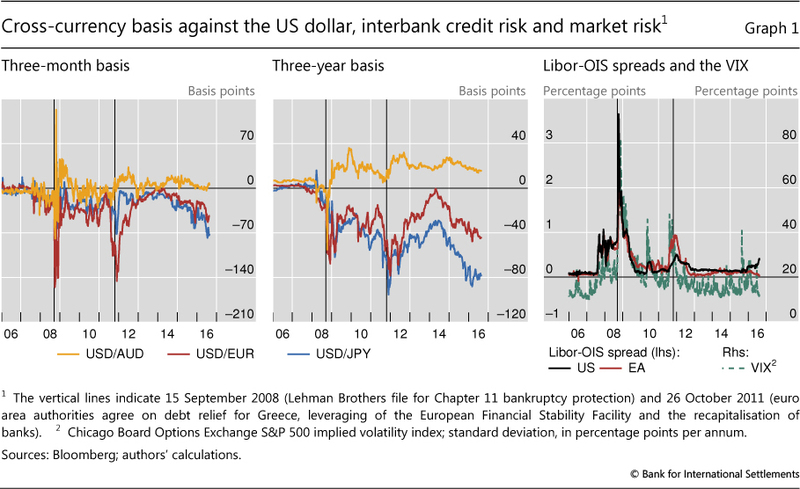 The indicator is added on its own and interacted with the Libor-OIS spread, as derived formally in Sushko et al (2016). In particular, the interaction of money market strains and hedging demand pressures (column (c), in bold) matters and money market strains alone (column (a)) now no longer exert a significant impact. The coefficient on the interaction term suggests that a 1% rise in the Libor-OIS spread combined with 1% higher demand for forward hedges is associated with a 45 basis point wider basis. This result indicates that higher demand for hedges works together with the market dislocations identified in previous research to drive the basis. Furthermore, for the two-year basis swap, the pressure of hedging demand has a direct (linear) effect on the basis (Table 1, third row, in bold), while the interaction term is no longer significant (fourth row). In particular, the estimated coefficient of -0.913 indicates that 1% higher demand for currency hedges translates into roughly a 1 basis point wider basis. This points to the cost of long-term cross-currency swaps being a more direct barometer of the imbalances in cross-currency flows hedged for currency risk, whereas the cost of short-term FX swaps is much more sensitive to risk premia and bank funding strains, particularly during crisis episodes (Graph 1). Overall, the econometric evidence indicates that, while generally ignored, hedging demand played a role even before the widening of the basis from 2014, when market tensions were subdued. No doubt, heightened counterparty risks did influence the basis in 2008-09 and again in 2011-12. But the demand for dollar hedging has been at work throughout.25 And it has continued to play a significant role since. We have argued that the puzzling systematic and persistent violation of CIP since the GFC reflects the combination of FX hedging demand and limits to arbitrage arising from lower balance sheet capacity, in turn due to tighter management of risks and associated balance sheet constraints. This explanation suggests that, even at the height of market tensions, hedging demand played an important, but underappreciated, role. We use BIS banking and debt securities statistics in combination with national data to construct estimates of currency hedging demand for select major currencies against the US dollar. 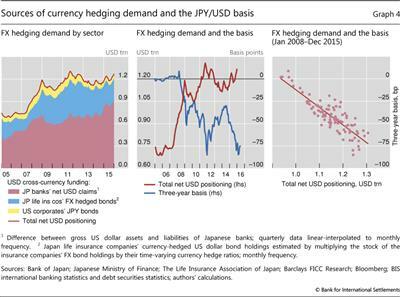 We find that quantity-based indicators of hedging demand track the variation in the basis both across currencies at a given point in time and, in the case of the dollar/yen basis, over time. 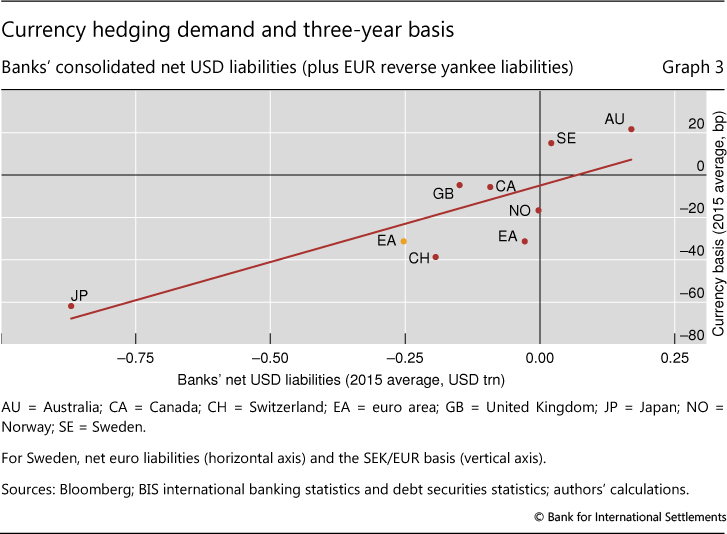 Importantly, our analysis has been largely confined to the proximate determinants of the basis, as we have not looked much into the factors driving currency hedging demand in the first place. We have mainly limited ourselves to documenting the possible importance of extraordinary monetary accommodation by the Bank of Japan and the ECB in widening the basis around policy announcements. Baba, N and F Packer (2009): "From turmoil to crisis: dislocations in the FX swap market before and after the failure of Lehman Brothers", Journal of International Money and Finance, vol 28, no 8, pp 1350-74. 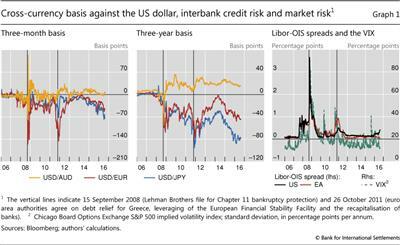 Baba, N, F Packer and T Nagano (2008): "The spillover of money market turbulence to FX swap and cross-currency swap markets", BIS Quarterly Review, March, pp 73-86. 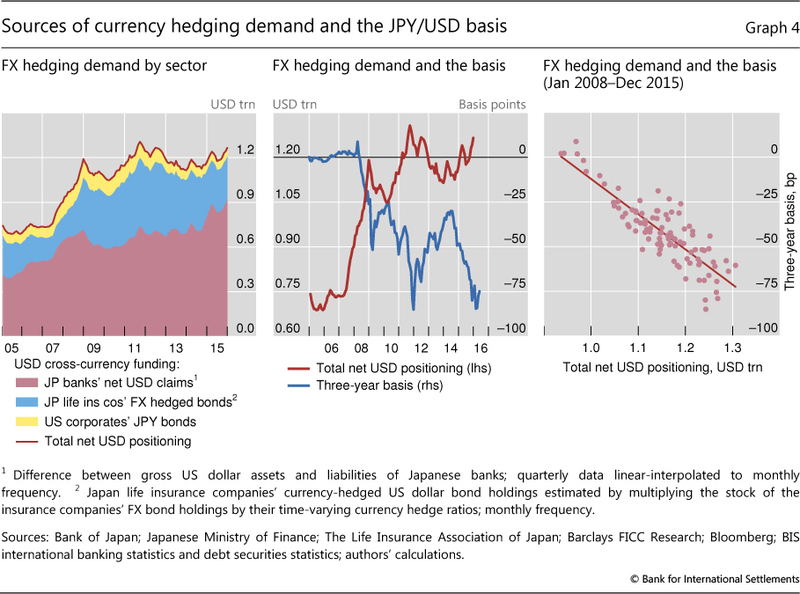 Barclays (2015): "Asia-Pacific cross-currency basis: widening pressure, from Japan to Asia", 1 December. Borio, C (2016): "More pluralism, more stability? ", speech at the Seventh High-level SNB-IMF Conference on the International Monetary System, Zurich, 10 May. Borio, C and A Zabai (2016): "Unconventional monetary policies: a re-appraisal", BIS Working Papers, no 570, July. Bräuning, F and V Ivashina (2016): "Monetary policy and global banking", June, mimeo. Cetorelli, N and L Goldberg (2011): "Global banks and international shock transmission: evidence from the crisis", IMF Economic Review, vol 59, no 1, pp 41-76. --- (2012): "Follow the money: quantifying domestic effects of foreign bank shocks in the Great Recession", American Economic Review, vol 102, no 3, pp 213-18. Coffey, N, W Hrung and A Sarkar (2009): "Capital constraints, counterparty risk, and deviations from covered interest parity", Federal Reserve Bank of New York, Staff Reports, no 393. Domanski, D, H S Shin and V Sushko (2015): "The hunt for duration: not waving but drowning? ", BIS Working Papers, no 519, October. Du, W, A Tepper and A Verdelhan (2016): "Covered interest rate parity deviations in the post-crisis world", May, available at SSRN 2768207 2768207, SSRN. Duffie, D (2016): "Why are big banks offering less liquidity to bond markets? ", Forbes, 11 March. Fender, I and P McGuire (2010): "Bank structure, funding risk and the transmission of shocks across countries: concepts and measurement", BIS Quarterly Review, September, pp 63-79. Hanajiri, T (1999): "Three Japan premiums in autumn 1997 and autumn 1998 - why did premiums differ between markets? ", Bank of Japan Financial Markets Department Working Paper Series, no 99-E-1. He, D, E Wong, A Tsang and K Ho (2015): "Asynchronous monetary policies and international dollar credit", Hong Kong Institute for Monetary Research, Working Papers, no 19-2015, September. Hilander, E (2014): "Short-term funding in foreign currency by major Swedish banks and their use of the short-term currency swap market", Sveriges Riksbank Economic Review, no 1, pp 1-23. Iida, T, T Kimura and N Sudo (2016): "An upsurge in a CIP deviation during the non-crisis period and the role of divergence in monetary policy", Bank of Japan Working Paper Series, no 16-E-14, August. Ivashina, V, D Scharfstein and J Stein (2015): "Dollar funding and the lending behavior of global banks", Quarterly Journal of Economics, vol 130, no 3, pp 1241-81. Levich, R (2012): "FX counterparty risk and trading activity in currency forward and future markets", Review of Financial Economics, 21, pp 102-10. Liao, G (2016): "Credit migration and covered interest parity", Harvard University, mimeo. Mancini Griffoli, T and A Ranaldo (2012): "Limits to arbitrage during the crisis: finding liquidity constraints and covered interest parity", Working Papers on Finance, no 1212, University of St Gallen School of Finance. McCauley, R and P McGuire (2014): "Non-US banks' claims on the Federal Reserve", BIS Quarterly Review, March, pp 89-97. McGuire, P and G von Peter (2009): "The US dollar shortage in global banking", BIS Quarterly Review, March, pp 47-63. --- (2012): "The US dollar shortage in global banking and the international policy response", International Finance, June. Pinnington, J and M Shamloo (2016): "Limits to arbitrage and deviations from covered interest rate parity", Bank of Canada, Staff Discussion Papers, 16-4. Pozsar, Z and S Smith (2016): "Japanese banks, LIBOR and the FX swap lines", Credit Suisse Fixed Income Research, Global Money Notes #7, August. Rush, A, D Sadeghian and M Wright (2013): "Foreign currency exposure and hedging in Australia", Reserve Bank of Australia, Bulletin, December, pp 49-57. Shin, H S (2010): Risk and liquidity, Oxford University Press. --- (2016): "Global liquidity and procyclicality", speech at the World Bank conference on The state of economics, the state of the world, Washington DC, 8 June. Shleifer, A and R Vishny (1997): "The limits of arbitrage", Journal of Finance, vol 52, no 1, pp 35-55. 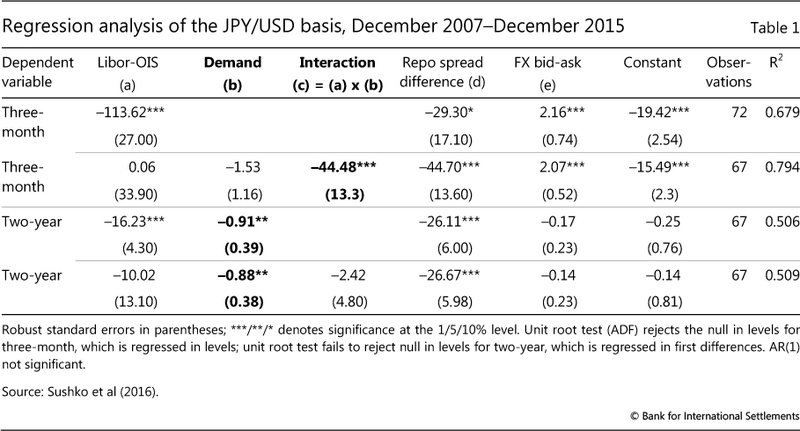 Sushko, V, C Borio, R McCauley and P McGuire (2016): "Failure of covered interest parity: FX hedging demand and costly balance sheets", BIS Working Papers, forthcoming. US Treasury, Federal Reserve Bank of New York and Board of Governors of the Federal Reserve System (2016): US portfolio holdings of foreign securities as of December 31, 2014, January. 1 The authors thank José María Vidal Pastor as well as Kristina Bektyakova, Branimir Gruić and Swapan Pradhan for research assistance; and Morten Bech, Matthew Boge, Wenxin Du, Teppei Nagano, Fabiola Ravazzolo and Jean-François Rigaudy for helpful discussions. We have also benefited from conversations with representatives of major dealer banks as well as supranational and agency debt issuers. In addition, we thank Benjamin Cohen, Dietrich Domanski, Torsten Ehlers, Cathérine Koch, Andreas Schrimpf, Hyun Song Shin, Konstantinos Tsatsaronis and Jens Ulrich for helpful comments. The views expressed are those of the authors and not necessarily those of the Bank for International Settlements. 2 Also, unlike in earlier US dollar funding stress episodes (Cetorelli and Goldberg (2011, 2012)), banks have drawn very little on central bank swap lines: https://apps.newyorkfed.org/markets/autorates/fxswaps-search-result-page. 3 Sushko et al (2016) treat these issues from a more technical perspective and provide broader econometric results. 4 He et al (2015) take the currency basis as given, to study the effects of FX swap market dislocations on the ability of non-US banks to supply US dollar loans when US monetary conditions tighten. 5 Transaction costs also appeared to play a temporary role for some currencies in the aftermath of the Swiss National Bank's abandonment of the currency peg (Pinnington and Shamloo (2016)). 6 For example, in the second half of 2015, temporary pressure on non-US banks' dollar funding emerged as US money market funds (MMFs) divested from their unsecured obligations. This reflected adjustment to US MMF regulatory reform set to take effect in October 2016. Still, at least in aggregate, non-US banks retained $5.5 trillion in deposits offshore and at their US branches in the last three quarters of 2015, which rose to $5.7 trillion in Q1 2016, according to BIS and Federal Reserve flow of funds data. 7 Domanski et al (2015) document increasing investment in long-term foreign currency bonds by the German insurance sector seeking to extend asset duration so as to match the rising duration of its liabilities as yields in the euro area fell to very low levels. 8 The FX-hedged investment has a payoff that resembles the return of leveraged investors in the target bond market: in the case of bonds, this is equal to the excess of the bond yield over the short-term financing cost ("the carry"), plus or minus a price gain or loss on the bond. 9 This would be so if the other sources of FX hedging demand co-move positively with those we identify. The exclusion of speculative demand may actually make it harder for us to find a relationship with hedging demand, as speculation may lead to offsetting pressure on the basis. For instance, easy monetary policy could boost FX-hedged investments in search of higher returns, but it could also encourage carry trades. Those carry trades could push down the forward rate even as hedging demand pushed it up. 10 For a conceptual discussion, see Duffie (2016). 11 This need not result from individual pricing decisions. For instance, internal credit limits may constrain individual balance sheets and, in aggregate, be reflected in a larger basis. 12 Our findings also hold if price indicators are used; see Sushko et al (2016). 13 Except in the case of Sweden, where we also look at the euro (see below). 14 Partly owing to data limitations, we do not include US banks' corresponding positions. US-headquartered banks' estimated net long positons in the key currencies we are considering are relatively small compared with non-US banks' net long dollar positions. As a result, the bulk of our analysis can safely focus on the latter. 15 This means that, except for the euro area, we cannot single out US dollar holdings, so that our estimate is an upper bound for the institutions covered. 16 Three quarters of US investors' holdings of foreign bonds were dollar-denominated at the end of 2014 (US Treasury et al (2016)). In general, hedge ratios for foreign equity holdings are low and well below those for bonds, so that they are less of an issue (although those of Japanese shares are often hedged). Hilander (2014, p 13) reports a 20% hedge ratio on foreign shares in Sweden. 17 We could also include domestic currency issuance by foreign firms from outside the United States, which may hedge into the US dollar (given its extensive international use), or hedge back into eg the Australian dollar or Canadian dollar through the US dollar. So, our figure should best be regarded as a lower bound. At the same time, not all issuance need be hedged: some firms may prefer to incur currency risk in an attempt to lower their funding costs further. 18 Moreover, given that credit spreads favour one currency over another, incentives to issue and put pressure on the basis are bound to be one-sided. In the case of the dollar/euro pair, for instance, where spreads have favoured issuance in euros, euro area issuers in dollars have typically been top-rated European supranationals and agencies, which can afford to issue in USD thanks to their top-notch creditworthiness. These institutions in effect operate as arbitrageurs, actively harvesting the basis (see also below). They do the same in the Australian dollar market. 19 Hilander (2014, Table 5) shows that, in addition to Swedish banks, foreign banks too provide currency hedges to Swedish investors, balancing them against the hedges provided to non-Swedish holders of Swedish bonds. 20 The figures for Japanese banks' net US dollar positions, which are derived from the BIS international banking statistics, include both these banks' own dollar positions and those managed on behalf of their clients (in trust accounts). As a result, the figures overstate the former. It is not known how much of trust account positions is hedged. However, for the analysis that follows, it is the dynamics of the series rather than the absolute amount that is important. As long as the share of the dollars held on behalf of clients in the total net dollar position of Japanese banks and their hedge ratios are relatively stable, then the inclusion of these positions should not bias our results. 21 Assets under management have been migrating from prime US institutional MMFs to government MMFs due to the reform to be phased in in October 2016. By August 2016, prime MMFs had lost more than $360 billion in assets, according to Fitch. Non-US banks, in particular, had lost substantial amounts of MMF funding, inducing them to seek other sources of US dollars, including through FX swaps. 22 We obtained the time-varying hedge ratios of Japan's life insurance companies by courtesy of Barclays FICC Research team; see Barclays (2015). In contrast to those of life insurance companies, the hedge ratios for Japan's pension funds (dominated by the unhedged Government Pension Investment Fund) are low, and therefore ought not to affect the basis. 23 At the end of 2013, major euro area supranationals had $660 billion equivalent in euro bonds outstanding, but only $355 billion in dollar bonds. In the following six quarters, they issued $192 billion in dollar bonds and only $178 billion in euro bonds, pointing to a shift of over $10 billion per quarter from euro to dollar. 24 For a much more extensive analysis, see Sushko et al (2016). 25 See Sushko et al (2016) for broader results, including panel evidence that extends the key results beyond the yen/dollar basis using exclusively the banks' position, for which consistent data are available.